Assimilaid ® is designed to maintain optimum health through proper nutrition and keeping the body in balance. Exclusively formulated with a proprietary blend of concentrated herbs for effectiveness, Assimilaid ® is a unique combination of Eastern herbal tradition and Western science. It’s highly concentrated and tastes pleasant if mixed in water. If you have heartburn, irregularity, constipation or other digestive issues, consider Assimilaid®. It is just wonderful for the digestive system! You can take it as it is, in capsule form or open them up and pour into warm water, wonderful after a heavy meal! 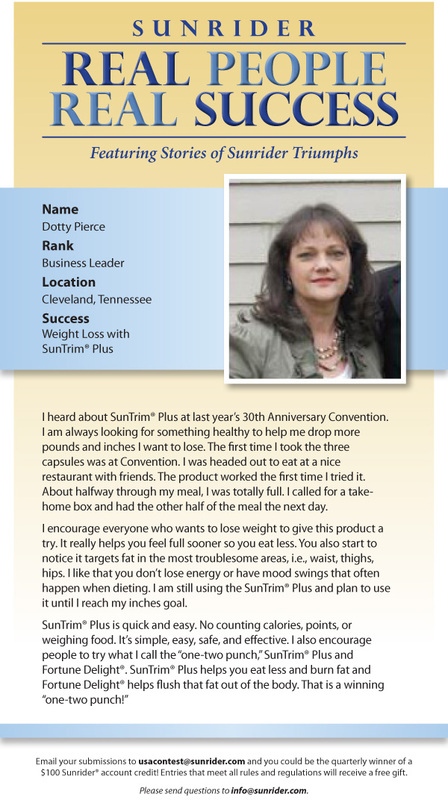 I heard about SunTrim Plus at last year’s 30th Anniversary Convention. I am always looking for something healthy to help me drop more pounds and inches I want to lose. The first time I took the three capsules was at Convention. I was headed out to eat at a nice restaurant with friends. The product worked the first time I tried it. About halfway through my meal, I was totally full. I called for a take-home box and had the other half of the meal the next day. I encourage everyone who wants to lose weight to give this product a try. It really helps you feel fuller sooner so you eat less. You also start to notice it targets fat int he most troublesome areas, i.e, waist, thighs , hips. I like that you don’t lose energy or have mood swings that often happen when dieting. I am still using the SunTrim Plus and plan to use it until I reach my inches goal. Be the first to review “Assimilaid” Click here to cancel reply.